It’s always interesting to see what FKA twigs will wear. 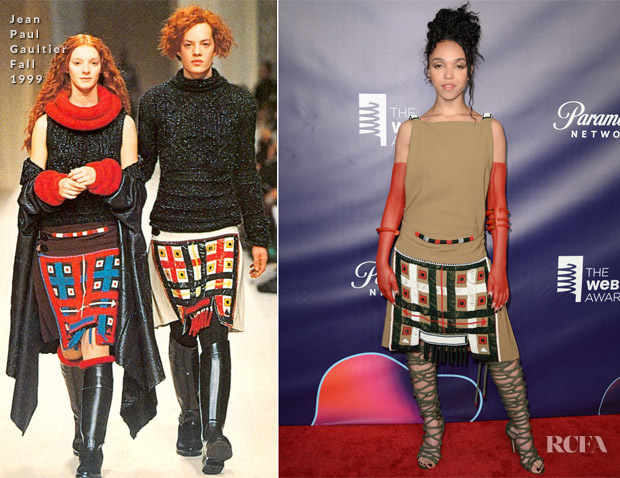 At the 22nd Annual Webby Awards on Monday (May 14) she was clad in a vintage Jean Paul Gaultier look from the Fall 1999 collection. From the front, the sleeveless style doesn’t have the most complicated silhouette but it’s enlivened with embellishment and the geometric design. When she turned around, it revealed a dramatic open back with multicoloured crisscross straps. The accessories made the look her own. The caged sandals brought out the tribal design while the sheer fingerless gloves added another unexpected detail. The unifying factors were the ensemble was bold, unique and true to her style.